Alopecia areata (AA) is a noncicatricial alopecia affecting any hair-bearing area. AA is considered to be an organ-specific autoimmune disease mediated by T lymphocytes directed to hair follicles. The exact etiology of AA remains unclear although several genetic and environmental factors have been shown to trigger the initiation of the disease. Some other studies have shown that oxidative stress plays a key role in the etiology of AA, also suggesting that production of reactive oxygen species (ROS) is significantly increased in AA.,, AA accounts for 2%–3% of new outpatient dermatology patients in the UK and the USA and 25% of all patients with alopecia. AA affects both genders equally and is mostly seen at the ages between 30 and 59 years., Most common clinical manifestation of AA includes oval patches of hair loss with characteristic exclamation mark hair and no signs of skin inflammation. The key histological feature of AA is the “swarm of bees” appearance of the peribulbar lymphocytic infiltrate around the anagen hair. Trace elements are highly essential for humans since they form the building blocks of large molecules, function as the cofactors of the enzymes, and have some key biological functions. Zinc (Zn), for instance, is an essential component of more than 300 enzymatic reactions. AA is currently treated with immunomodulatory drugs and intralesional steroid injections that have a high risk of side effects. Therefore, trace elements could be a promising treatment option for AA since they have a low risk of side effects and are highly practical. 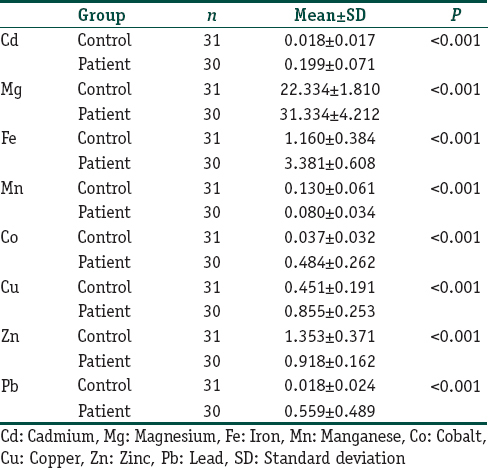 In this study, we aimed to investigate serum levels of trace elements including iron (Fe), Zn, manganese (Mn), copper (Cu), and magnesium (Mg) and heavy metals including cobalt (Co), Cd, and Pb in patients with AA. The study included a patient group of 30 with AA and a control group of 31 healthy individuals. All the patients underwent clinical and dermatological examinations. Demographic characteristics including age, gender, socioeconomic status, family history, and duration of disease were recorded for each patient. Inclusion criteria for the patient group were typical patches of AA and the presence of exclamation mark hair [Figure 1]. Exclusion criteria included systemic diseases (anemia, thalassemia, metabolic diseases, and autoimmune diseases), on prior dietary or drug supplement, and refusal to participate or to sign informed consent. Also, patients who were pregnant, under 18 years of age, with a history of alcohol abuse, on dietary supplements, and oral medications (oral contraceptives, Mg-containing laxatives, and diuretic drugs), and hair disorders, such as telogen effluvium and cicatricial alopecia were also excluded from the study. The control group included individuals who were diagnosed with tinea pedis at the dermatology department and had no other diseases. Clearance from Institutional Ethics Committee was obtained and informed consent form was signed by individual participants before inclusion in the study. Blood samples were collected from the antecubital vein using an 18 G needle in each participant. The samples were collected in glass tubes, placed in cold boxes, and then were transferred to the laboratory. Serum was separated after centrifugation of the samples at 2500 rpm at 4°C for 15 min. The samples were stored at −80°C until analysis. Serum levels of Fe, Zn, Cu, Mn, Mg, Co, Cd, and Pb were measured using an atomic absorption spectrophotometer (Unicam 929, Unicam Ltd., Cambridge, UK) at the Division of Biochemistry, Department of Chemistry, Yuzuncu Yil University, Van, Turkey. Atomic absorption spectrophotometry is an optimal technique for the measurement of heavy metal and trace element concentrations due to its high sensitivity and specificity. Descriptive statistics for the continuous variables were presented as mean, standard deviation, and minimum and maximum values while count and percentages were used for categorical variables. Mann–Whitney U-test was used to compare group means. In addition, Chi-square test was performed to determine the relationship between categorical variables. Statistically significant level was considered as below 5% and SPSS software, version 13.0 (SPSS, Inc., Chicago, IL, USA) statistical program was used for all statistical computations. The 30 patients included 17 (56.7%) men and 13 (43.3%) women with a mean age of 33.8 (range, 19–48) years. The 31 controls included 18 (58.1%) men and 13 (41.9%) women with a mean age of 33.0 (range, 20–54) years. There was no difference between the groups in terms of gender and age (P > 0.05). Family history of AA was present in 6 (20%) patients. A history of smoking was present in 22 (73.3%) patients. Smoking was significantly higher in the patient group than the control group (P < 0.05). A solitary alopecic patch was present in 15 (50%) and numerous alopecic patches were found in 15 (50%) patients. [Table 1] presents the comparison of the mean levels of Cd, Fe, Mg, Mn, Pb, Zn, Co, and Cu between the two groups. As shown in [Table 1], serum levels of heavy metals were significantly different between the two groups (P < 0.05). In addition, while serum levels of Zn and Mn were significantly lower, serum levels of Cd, Fe, Mg, Pb, Co, and Cu were significantly higher in the patient group compared to that of the control group (P < 0.05). In particular, the serum levels of Cd, Fe, Mg, Pb, Co, and Cu in the patient group were nearly ten times greater than those in the control group. The results revealed that all the heavy metals analyzed in this study were associated with AA. The results also suggested that Zn supplementation could be useful in the treatment of AA while Fe supplementation would have no use for the treatment. Cd does not only inhibit DNA-repair enzymes but also stimulates ROS production in polymorphonuclear neutrophils, thereby inducing inflammatory response. Smoking is a major cause of nonoccupational Cd exposure. Moreover, smokers have significantly higher concentrations of Cd in urine, blood, hair, and tissue compared to nonsmokers., Krocova et al. reported that Cd and Pb can cause autoimmune diseases by inducing inflammatory response even at lower concentrations. Similarly, Shen et al. noted that heavy metals can cause autoimmune activity by increasing T-cell proliferation. In our study, serum Cd level was significantly higher in the patient group compared to that of the control group, which implicated that Cd could be a cause of autoimmunity in AA and there could be a relationship between smoking and AA. Akar et al. suggested that antioxidant enzymes and lipid peroxidation could have a key role in AA and also noted that the increase in antioxidant enzymes could result from oxidative stress. Similarly, Bakry et al. reported that AA impaired the antioxidant system and also increased oxidative stress. On the other hand, Valko et al. suggested that heavy metals including Co, Cd, Hg, and nickel increased ROS production, thereby leading to oxidative stress. In our patients, Cd concentration was significantly higher in the patient group compared to the control group, implicating that increased Cd concentration might have induced AA in our patients by increasing oxidative stress. Pb participates in electron transport chain, leading to ROS generation. Although the pathogenesis of Pb toxicity is multifactorial, Pb exerts its effect by promoting ROS formation, interrupting enzyme activation, and inhibiting trace mineral absorption., Chiba et al. showed that Pb exposure led to increased oxidative stress. In our study, serum Pb level was also increased in patients with AA, which suggests that increased Pb concentration might have induced AA in our patients either by increasing ROS production or by triggering autoimmunity similar to Cd. Co is a key component of the structure of Vitamin B12. Co is also an essential metal in heavy industry. However, exposure to Co has increased recently, particularly with the growing use of mobile phone batteries, plasma screens, and liquid crystal display screens. Moreover, Co is one of the most common causes of occupational contact dermatitis and may have toxic effects on numerous organs and tissues. In our study, serum Co level was significantly higher in patients with AA, which suggested that increased Co concentration might be a cause of AA. In addition, the increasing exposure to heavy metals as a result of industrialization might be another cause of AA. Literature reviews indicated that there were a limited number of studies reporting on the relationship between trace elements and AA. Bhat et al. evaluated 50 patients with AA and reported that serum Zn level was significantly lower in the patient group compared to the control group while no significant difference was found in serum Cu and Mg levels between the groups. The authors concluded that Zn deficiency might be a cause of AA. In a similar study, Dastgheib et al. evaluated 16 patients with AA and 27 healthy female controls and found no significant difference in the Zn, Fe, and Cu levels in hair and serum between the two groups. The study also noted that the concentrations of the trace elements in hair and serum might not have a direct effect on the onset of AA and thus supplementation of trace elements would have no use for the treatment of AA. Jin et al. conducted a meta-analysis spanning the period between January 1990 and April 2016 and analyzed 10 studies including a total of 435 patients and 329 controls. The study indicated that serum Zn concentration was significantly lower in the patient groups compared to the control groups while serum Cu and Mg levels established no significant difference between the groups. The study concluded that there can be a significant relationship between serum Zn concentration and AA. In our study, serum Zn level was lower in the patient group compared to the control group, which was similar to all the previous studies except for the study reported by Dastgheib et al. However, serum Cu and Mg levels were higher in the patient group compared to that of the control group, suggesting that supplementation of Cu and Mg might have no place in the treatment of AA. Esfandiarpour et al. evaluated 52 patients with AA and noted that serum Fe levels were significantly higher in the patient group compared to that of the control group. However, the study concluded that the effect of Fe deficiency on the development of AA remains controversial. Similarly, Boffa et al. evaluated Fe concentration in 32 patients with AA and found no Fe deficiency in any patient. In our study, serum Fe levels were higher in the patient group compared to the control group, which was consistent with the literature. Mn is of particular importance to organisms since it functions as a metal coenzyme. Moreover, Mn also plays a key role in mitochondrial function, fatty acid metabolism, and protein synthesis through its effect on the arginase enzyme and is also responsible for normal thyroid and adrenal gland activity. On the other hand, Mn toxicity is relatively rare and is mostly seen in the workers in steel and iron industries., To our knowledge, there is no study in the literature reporting on the relationship between Mn and AA. In our study, Mn levels were significantly lower in the patient group compared to that of the control group, which implicated that Mn deficiency could be a cause of AA in our patients. Our study had limitation since it was a single-center study and had a relatively low number of patients. In conclusion, the use of heavy metals in human life is increasing on a daily basis. Moreover, the adverse effects of these metals on human health can be seen easier when compared to their beneficial effects. Further multicenter studies with larger patient series are needed to deepen our understanding in the effects of heavy metals and trace elements. Wasserman D, Guzman-Sanchez DA, Scott K, McMichael A. Alopecia areata. Int J Dermatol 2007;46:121-31. Gilhar A, Paus R, Kalish RS. Lymphocytes, neuropeptides, and genes involved in alopecia areata. J Clin Invest 2007;117:2019-27. Sperling LC, Lupton GP. Histopathology of non-scarring alopecia. J Cutan Pathol 1995;22:97-114. Tapiero H, Tew KD. Trace elements in human physiology and pathology: Zinc and metallothioneins. Biomed Pharmacother 2003;57:399-411. Thompson JM, Mirza MA, Park MK, Qureshi AA, Cho E. The role of micronutrients in alopecia areata: A Review. Am J Clin Dermatol 2017;18:663-79. Morais S, e Costa FG, de Lourdes Pereira M. Heavy Metals and Human Health. Rijeka, Croatia: Environmental Health-Emerging Issues and Practice: InTech; 2012. Izah SC, Inyang IR, Angaye TCN, Okowa IP. A review of heavy metal concentration and potential health implications of beverages consumed in Nigeria. Toxics 2016;5:pii: E1. Ercal N, Gurer-Orhan H, Aykin-Burns N. Toxic metals and oxidative stress part I: Mechanisms involved in metal-induced oxidative damage. Curr Top Med Chem 2001;1:529-39. Valko M, Morris H, Cronin MT. Metals, toxicity and oxidative stress. Curr Med Chem 2005;12:1161-208. Jan AT, Azam M, Siddiqui K, Ali A, Choi I, Haq QM, et al. Heavy metals and human health: Mechanistic insight into toxicity and counter defense system of antioxidants. Int J Mol Sci 2015;16:29592-630. Druet P. Metal-induced autoimmunity. Hum Exp Toxicol 1995;14:120-1. Marth E, Jelovcan S, Kleinhappl B, Gutschi A, Barth S. The effect of heavy metals on the immune system at low concentrations. Int J Occup Med Environ Health 2001;14:375-86. Shen X, Lee K, König R. Effects of heavy metal ions on resting and antigen-activated CD4(+) T cells. Toxicology 2001;169:67-80. Suzuki Y, Inoue T, Ra C. Autoimmunity-inducing metals (Hg, Au and Ag) modulate mast cell signaling, function and survival. Curr Pharm Des 2011;17:3805-14. Tchounwou PB, Yedjou CG, Patlolla AK, Sutton DJ. Heavy Metal Toxicity and the Environment. Molecular, Clinical and Environmental Toxicology. Basel: Springer; 2012. p. 133-64. Richter P, Faroon O, Pappas RS. Cadmium and cadmium/Zinc ratios and tobacco-related morbidities. Int J Environ Res Public Health 2017;14:pii: E1154. Krocova Z, Macela A, Kroca M, Hernychova L. The immunomodulatory effect(s) of lead and cadmium on the cells of immune system in vitro. Toxicol In Vitro 2000;14:33-40. Bellinger DC. Lead neurotoxicity in children: Decomposing the variability in dose-effect relationships. Am J Ind Med 2007;50:720-8. Rossi E. Low level environmental lead exposure--a continuing challenge. Clin Biochem Rev 2008;29:63-70. Chiba M, Shinohara A, Matsushita K, Watanabe H, Inaba Y. Indices of lead-exposure in blood and urine of lead-exposed workers and concentrations of major and trace elements and activities of SOD, GSH-px and catalase in their blood. Tohoku J Exp Med 1996;178:49-62. Leyssens L, Vinck B, Van Der Straeten C, Wuyts F, Maes L. Cobalt toxicity in humans - A review of the potential sources and systemic health effects. Toxicology 2017;387:43-56. 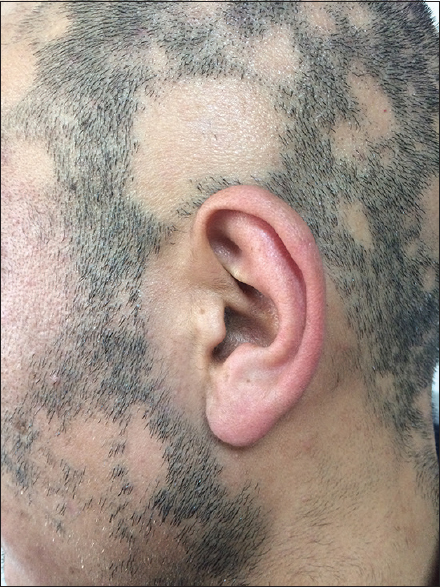 Bhat YJ, Manzoor S, Khan AR, Qayoom S. Trace element levels in alopecia areata. Indian J Dermatol Venereol Leprol 2009;75:29-31. Dastgheib L, Mostafavi-Pour Z, Abdorazagh AA, Khoshdel Z, Sadati MS, Ahrari I, et al. Comparison of Zn, Cu, and Fe content in hair and serum in alopecia areata patients with normal group. Dermatol Res Pract 2014;2014:784863. Jin W, Zheng H, Shan B, Wu Y. Changes of serum trace elements level in patients with alopecia areata: A meta-analysis. J Dermatol 2017;44:588-91. Esfandiarpour I, Farajzadeh S, Abbaszadeh M. Evaluation of serum iron and ferritin levels in alopecia areata. Dermatol Online J 2008;14:21. Boffa MJ, Wood P, Griffiths CE. Iron status of patients with alopecia areata. Br J Dermatol 1995;132:662-4. Watts DL. The nutritional relationships of manganese. J Orthomol Med 1990;5:219-22. Santamaria AB. Manganese exposure, essentiality and toxicity. Indian J Med Res 2008;128:484-500.